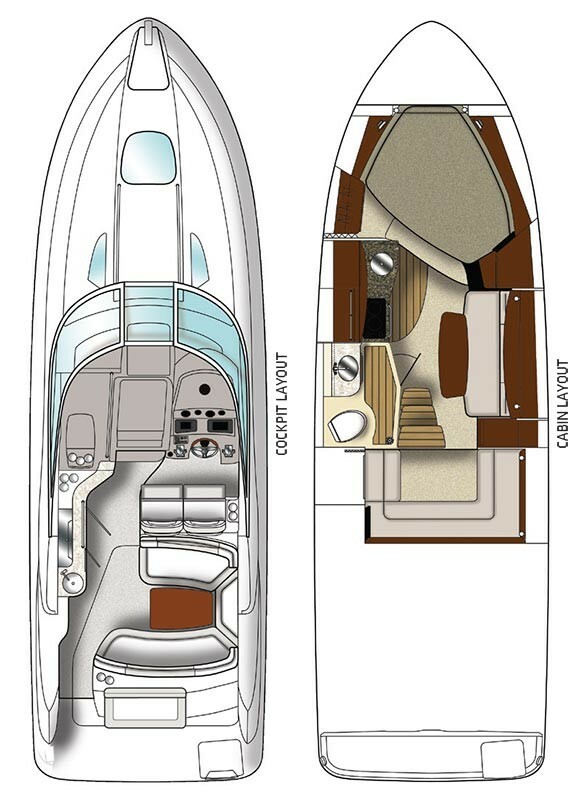 With a social cockpit zone, a comfortable cabin and a wide, easily accessible swim platform, your options for enjoyment abound in the 330 Sundancer. We spend our whole lives overbooked. Do more in your precious downtime with the 330 Sundancer. Take a longer weekend, extend your day of boating by a few golden hours. The 330 Sundancer is equipped to let you share the magic and peace of the water with as many people as you choose or just one special person for that romantic getaway. How long you can stay on the water is directly related to your ease aboard, so the 330 Sundancer is all about comfort. A fiberglass arch top with extended aft sunshade provides all the protection you need to enjoy every hour of sun on your Sea Ray. Sometimes, you’re just not ready to go back to shore. Aboard the 330 Sundancer, you don’t have to. The convertible salon sofa and midship berth expand overnight accommodations to six. Now you don’t have to cut your day short because you don’t have enough space for guests to stay the night. Rest easy, the party does not need to end at sundown.